In 1978 I moved to Center City Philadelphia, on Rodman Street between 11th and 12th. After years of living in homogenized apartment complexes in the suburbs, I moved into an older building on a street so narrow there was only room for one car to pass with no parking at the curb! I moved into an apartment one floor above my friend Neal’s. Center City Philadelphia was great. I could walk out my front door to get the paper or have a bite to eat. No car was necessary in the neighborhood and almost anything you wanted was in the neighborhood. One day, early on, I found Neal played Scrabble and I asked if he wanted a game. That began a Scrabble obsession. We played that first game and I immediately realized Neal operated on a different Scrabble level from me. He put down “ani” and “zygote.” My jaw fell. How could I compete when I didn’t know “aa” was a Hawaiian volcanic rock? Of the first 20 games we played, I lost 19. Actually, I lost 19 in a row before winning one, and that was probably because of incredibly lucky tile selection. People who don’t play it think poker is a game of luck, not skill. They don’t realize that Scrabble has many of the same elements of skill versus chance… yet no one thinks of Scrabble as a game of luck. After 19 losses I certainly didn’t. I played Neal enough to get better, though certainly never anywhere near as good as he was. When I moved from Philadelphia to Buffalo, the Scrabble playing ended. With Neal I had the willing partner and convenience that I’d never find again. May your Neilson ratings never fall as low as our first game. May your future be a seven letter word with a triple word score. 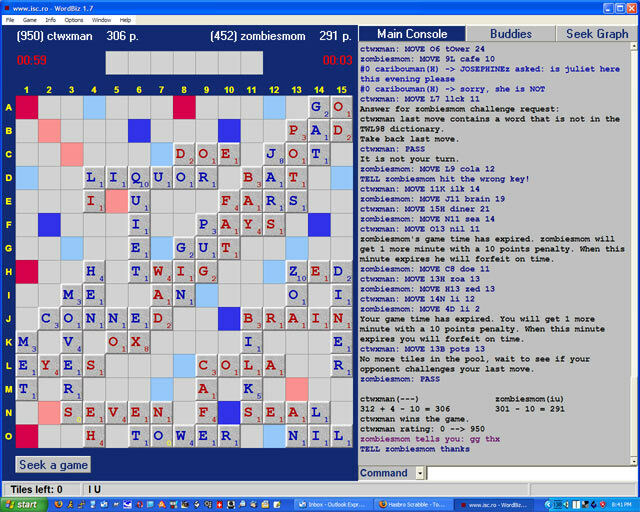 When I first got on the Internet in the late 80s&#185 I found a server (in Toronto I think) which hosted Scrabble games. I played for a while, but as the net developed and there were other things to see, I lost interest. A few nights ago I watched a Scrabble documentary on the Times/Discovery Channel. All of a sudden I was motivated to play again. After a few minutes of searching I found a site which hosts free online Scrabble games. I know the Scrabble trademark is incredibly well protected, so the only reason this site survives probably has to do with the fact that it’s in Romania. I downloaded the software and started to play Thursday. By Friday I had 5 games under my belt (4 losses, though the last was only by 2 points). Since the site records all your games and understands the competition you’re playing against, it ranks you as a player. Now I will have a goal, improve my ranking. As with online poker, it is not too difficult to cheat while playing. I am hoping that the others I play against, who have sworn not to cheat, uphold their end of the bargain. In the meantime, I wonder if Neal knows about this? Before long I could be losing to him again! &#185 – When I first got on the Internet (thanks to a co-worker who was able to get me an account from his university) it was a very different place. Web browsing was done in a non-graphical way. Information was found on Gophers and Archie servers. It was totally non-commercial. Next Next post: Asteroid 2004 MN4 – Who Invited Him?